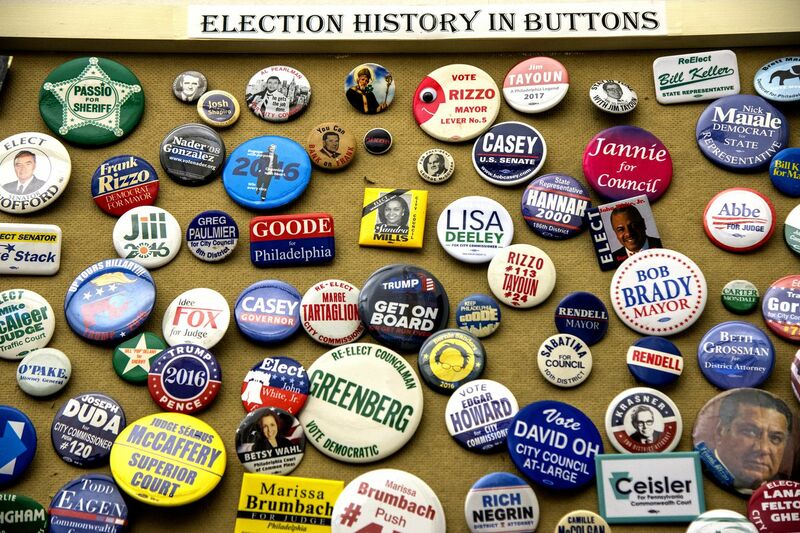 Campaign buttons from decades of Philadelphia elections are collected on a bulletin board at the Board of Elections in City Hall March 12, 2019, as the deadline looms for candidates to file nomination petitions to get on the May 21 primary ballot. The staff locks the office door at 5 p.m. sharp. The Philadelphia Board of Elections had to call for backup staff Tuesday as legal challenges to candidates’ nomination papers piled up. One candidate for Council at-large even filed to block from the ballot 30 of the 33 other Democrats against whom he’s running. A filing cart and extra hands arrived right after the deadline at 5 p.m, though the board wasn’t quite sure what to do with Devon Cade’s mass challenge. That is just one of many confusing things about the intricate Pennsylvania rules that govern qualifications to be on the ballot. Armstrong, in turn, faces a challenge from attorney Charles Gibbs, on behalf of a voter, to the validity of 518 of her 1,025 submitted signatures. A run for district Council seats requires 750 valid signatures from registered voters in that district. It’s unclear how many of those challenged by the 5 p.m. Tuesday deadline worked with a political consultant who is alleged to have botched several petitions for judicial candidates, prompting at least one to drop out of the race Tuesday. Councilman Mark Squilla was challenged by his 1st District opponent. Democrat Lou Lanni, who formerly ran for state representative and before that for Council as a Republican, was convicted on insurance fraud charges but pardoned by the governor in 2016. He claims 1,780 of Squilla’s 2,047 signatures are bogus. In a move that required a lot of paperwork, Cade, who lists his occupation as “philanthropist,” filed identical challenges against 30 opponents for Council at-large. In each case, he offered an “affidavit of forgery," a document Board of Elections staff said they had not seen before. Not helping matters: Cade’s motion was filled with redactions. Cade did not challenge Helen Gym, who is seeking a second at-large term, or Sherrie Cohen or Wayne Allen. Allen faces another challenge, as do at-large candidate and former Lt. Gov. Mike Stack III and former Traffic Court Judge Willie Singletary, a convicted felon. Both Democrats running against Councilwoman Cindy Bass in the 8th District were challenged. Patrick Jones, dropped out of the race the same day a petition was filed that claimed 738 of his 1,261 signatures filed were no good. Tonya Bah, who remains in the race, is accused of failing to file her statement of financial interest with the Department of Records.